Two Pore Guys, Inc. (2PG), today announced the close of a Series A venture financing round in the amount of $24.5 million, led by Khosla Ventures. The new funding will be used to scale up manufacturing of 2PG’s hand-held, point-of-use testing system, which works like a glucose monitor, though its disposable test strips can detect virtually any kind of molecule with very high sensitivity. The financing will also enable the company to expand its executive team and further advance its two-pore technology for whole genome sequencing and genome mapping. 2PG’s novel use of solid-state nanopores enables digital, single-molecule sensing in a small, inexpensive, and simple-to-use form factor. The devices transmit data wirelessly to authorized systems and cloud infrastructures, thereby enabling such uses as telemedicine, clinical trials for drug development, and global tracking of pathogens and diseases. The company has begun collaborating with companies across multiple markets that plan to develop tests for the platform, similar to how software developers make apps for smartphones. Target uses include human and animal diagnostics, agriculture, food safety testing, environmental monitoring, regulatory, and defense. 2PG’s business model is similar to the smartphone app-store model. Specific assays are developed by third parties to detect virtually any kind of molecule. Even existing tests made for traditional centralized lab equipment can be adapted to 2PG’s platform, allowing for a potentially unlimited menu of high-sensitivity tests to reach the market. 2PG manufactures the reader devices and test strips that incorporate the reagents from a partner’s assays, which are then sold through master distributors. 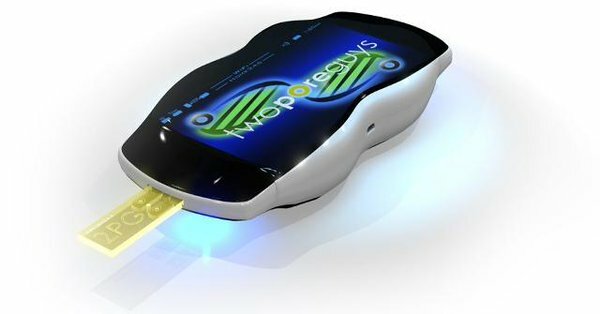 Two Pore Guys (2PG) has developed a handheld, single-molecule sensing platform with the accuracy, precision, and sensitivity of reference lab equipment and sample-in, results-out capability. The core technology includes solid-state, nanopore-based sensors that can detect nucleic acids and proteins and other analytes in human, animal, agriculture, and environmental samples. The battery-operated device is ideal for point-of-use applications. The easy-to-use platform is designed to sync with a smartphone or computer for further analysis and data sharing, including integration with electronic health records. Founded in 2011, the company is based in Santa Cruz, Calif. More information is available at twoporeguys.com.